Whether you are suffering from diabetes and constantly ask yourself, “What can I eat?” it's time to stop worrying! Living with diabetes does not necessarily feel difficult to pick food. You can learn to balance your food and make healthy food choices for the body. 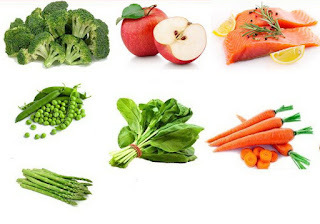 Best foods for diabetes are usually whole foods that are not processed, such as fruit and vegetables. Eat healthy food healthy extras in the daily menu will help you meet Your nutritional needs, as well as lowering the risk of diabetes complications, such as heart disease. Unlike meat, seafood have saturated fat and unhealthy cholesterol lower, plus is also a source of omega-3 fatty acids is good, especially from fatty fish such as salmon, trout, sardines, tuna, and halibut. According to the American Heart Association, omega-3 fatty acids decreases the risk of arrhythmias (abnormal heart rate), which can cause sudden death. Omega-3s also lowers the levels of triglycerides, slowing the rate of growth of atherosclerotic plaque, lowers blood pressure, and reduce inflammation. With this, it is no wonder if fish became one of healthy foods for diabetic’s favorites. Asparagus has 5 grams of carbohydrates, 20 calories, and nearly 2 grams of dietary fiber per serving which is very rich in an antioxidant called glutathione, which plays an important role in reducing the effects of aging and many diseases, including diabetes, a disease heart, and cancer. This makes asparagus being one of the healthiest foods good for diabetics. A study by the year 2012 at the Ohio State University published in the Journal of Functional Foods found that eating one Apple a day for four weeks may decrease LDL cholesterol of 40 percent. Professor who led the study explains that not all antioxidants are created equal, and that certain types of antioxidants in apples have a profound effect on the decrease in LDL. Apple also provides some protection against diabetes. Harvard School of Public Health examine the diet at 200,000 people and found that those who reported consuming five or more apples a week had a 23 percent lower risk of affected by type 2 diabetes compared with those who did not eat the apples. The next food for diabetics is broccoli. Broccoli has more vitamin C per 100 grams than oranges, plus a high content of beta carotene, which the body uses to make vitamin A. Vitamin A has the advantage of healthy teeth, bones and skin. Broccoli is also rich in folate and fiber, containing only a few calories and carbohydrates. Nuts are indeed high content of fiber and a good source of protein, but now there is more reason to include it in the diabetic food menu. In a study of the year 2012, the researchers found that consuming one glass of peas per day produces more blood sugar control is good (for blood glucose) and lower blood pressure. The carrot is famous for its vitamin A content of its high antioxidant beta carotene in carrots. This vitamin is necessary for vision and immune function, and carrots may help prevent the development of some types of cancer. Now there are more good reasons to eat carrots. According to a study reported in the year 2013 from Stanford University School of Medicine, beta-carotene can even help lower the risk of type 2 diabetes among people who have a genetic predisposition to suffer from this disease. The American Diabetes Association (ADA) reported on a study to determine whether consuming more fruits and vegetables can reduce the risk of diabetes. The answer is that people who eat more leafy green vegetables (spinach in particular included) reduce their chances affected by type 2 diabetes of 14 percent. Who would have thought a simple vegetable such as spinach turned out could be a source of healthy food for diabetics? Well, now you're not confused anymore right? You don't have to be afraid anymore to eat healthy foods that are delicious, not only because of suffering from diabetes. But if you suffer from acute diabetes, it is important for you to partner with your doctor and dietitian to make a meal plan suitable for you. Eat healthy food, portion control and scheduling to manage your blood glucose levels.